Beals, a San Francisco native, starred at Santa Clara and was chosen by the Chicago Bears in the 8th round of the 1942 NFL draft. Due to World War II, however, he first went into the military for three years. Afterward he signed with the 49ers of the new AAFC, who heavily recruited ex-Bay Area college players, including from Santa Clara, where Head Coach Buck Shaw had been for seven years and was thus familiar with Beals. 49ers went 9-5 to finish second in the AAFC Western Division while leading the league in rushing yards (2175). 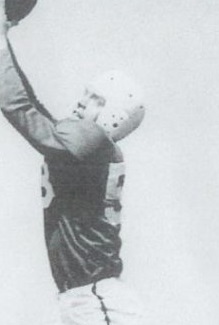 Beals, who caught a career-high 47 passes in 1947, went on to lead the AAFC in pass receiving touchdowns in each of the circuit’s four seasons. He received first-team All-AAFC honors from the league in 1948 and ’49 and was a second-team choice in 1947. Beals ended up being the top scorer in the league’s four-year history, scoring 46 touchdowns and, with two extra points thrown in, 278 points. He also ranked second with 177 pass receptions, for 2510 yards (14.2 avg.) and all of the TDs. Beals spent two more lesser seasons with the 49ers in the NFL in 1950 and ‘51, adding 34 more pass receptions for 441 yards (13.0 avg.) and three TDs.